The original mozzarella low carb pizza is called ‘Fathead'pizza and was created by Tom Naughton. It was named after Naughton's FatHead the movie, which challenged the persistent myth that fat is bad for our health and instead introduced the radical idea that sugar and excess carbohydrates are the culprits behind heart disease. I send big respect to Tom for both of these pioneering ideas! This is my adaptation of the original Fathead pizza recipe. It’s sort of hard to believe that mozzarella cheese will turn out a thin & delicious crust, I know! But really, you just have to try it to believe it. 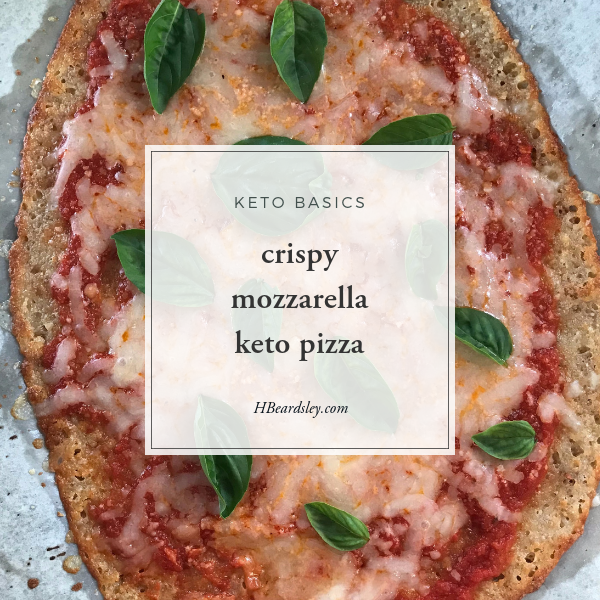 Most Fathead pizza recipes use almond flour in the cheese crust, but I prefer to use pork rind dust because it works just as well without any added carbs. this is how my pizza has just 2 carbohydrates for 1/2 the pizza! Compare that to 47 grams of carbohydrate for 1/2 of a Newman's Own pizza. Woot! now you can have your pizza, love the taste, and feel great about Friday night pizza night!! I find that with myself and my clients that almond flour can spike blood sugar and it kicks me out of fat-burning mode (ketosis), so in my adaptation of this recipe I use pork rind dust. I promise you that this pizza crust does not taste at all like pork rinds! However, if you prefer almond flour it works great, but note that your carb count will be higher than listed in the nutrition information. 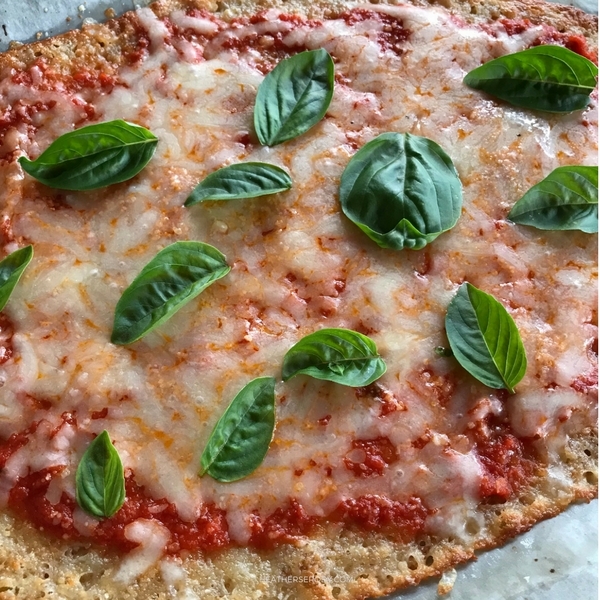 I top my fathead pizza crust with Mario Batali marinara sauce because it's available in most grocery stores and there is no added sugar. Thank-you Mario! Top with lots of fresh basil, and you can't believe how fresh and savory this low carb pizza is! This Miracle Mozzarella Pizza recipe is so versatile that it can be rolled out in different ways to make tortillas, crackers, & even nachos, too. Experiment and have fun with it. Add 3/4 of the package of mozzarella (1&3/4 C) the shredded mozzarella, pork rind dust or almond flour & cream cheese in a microwaveable bowl. Add the egg & stir with a spatula until combined. Turn the dough out onto a sheet pan lined with TWO sheets of parchment paper. (this helps to absorb the excess oil.) Using the spatula, spread the dough out into a circular pizza shape, or just press it onto a circle with your hands. Using a fork, prick the dough all over so that it cooks evenly. Bake dough at 425ºF for 8-12-minutes, or until bubbling & just starting to turn brown on the edges. 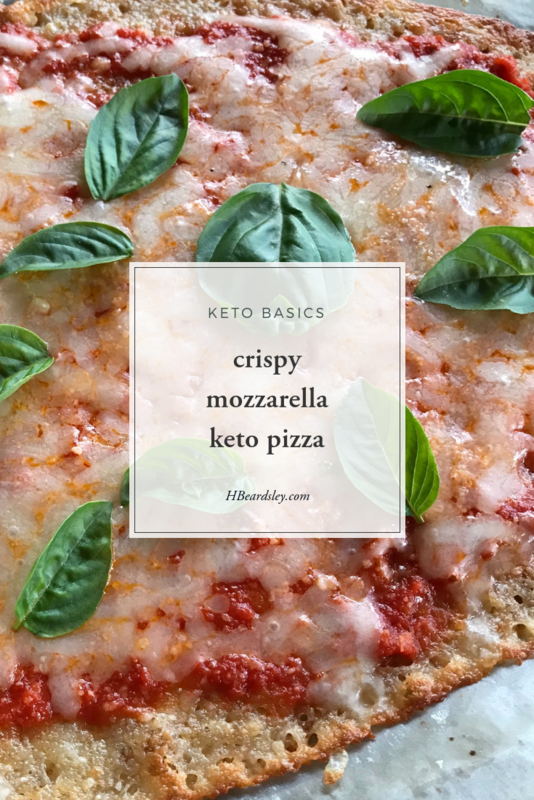 Once precooked, remove the dough from the oven and add marinara sauce, the remaining mozzarella & parmesan cheeses and any other optional toppings of your choice. Return the pizza back to the oven and cook just long enough to heat up the toppings and melt the cheese. About 5 minutes. When finished cooking, allow the pizza to cool for a few minutes so that it firms up. Add basil leaves. I like to cut it with a pizza cutter & serve it right on the sheet pan. Nutritional information is for using pork rind dust, but without additional toppings.